“If sea ice declines at the rates projected by the IPCC climate models, and continues to influence Emperor penguins as it did in the second half of the 20th century in Terre Adélie, at least two-thirds of the colonies are projected to have declined by greater than 50 percent from their current size by 2100,” said study author Jenouvrier. Photo by Peter Kimball, Woods Hole Oceanographic; used with permission. All 45 known emperor penguins colonies in Antarctica could be in decline by the century’s end, making this species, “fully deserving of endangered status due to climate change”, according to a new study published in Nature Climate Change. Declines could be severe in at least two thirds of the colonies, where numbers could drop by more than half. The reason: loss of Antarctic sea ice. The emperor’s survival hinges on this frozen platform for every stage of its life cycle. Sea ice provides a haven for raising chicks, a launch pad for hunting trips, and marine habitat for key prey species, including shrimp-like krill. The new study, by an international team of researchers, modelled how current and future sea ice concentration (based on IPCC projections) could affect emperor populations, accounting for specific conditions at each colony. The emperor’s last stand against climate change is likely to be at the Ross Sea, where the southern ocean cuts deep into the frozen heart of Antarctica. Now home to about a quarter of all breeding emperors, the Ross Sea could be the best area to focus future conservation efforts, the study’s authors assert. However, lead author Stephanie Jenouvrier said in a media statement that, “None of the colonies, even the southern-most locations in the Ross Sea, will provide a viable refuge by the end of 21st century.” This highlights the importance of reducing greenhouse gas emission to prevent the more severe consequences of climate change. Emperor penguins are challenging to study because they breed in the coldest environment of any bird, enduring sunless, Antarctic winter days with temperatures that can plunge below minus 60 °C. The new research builds on a rare and exceptionally long record of observation at Terre Adélie, in eastern Antarctica. Fifty years of detailed study of emperor mating, chick-rearing and foraging has revealed that the sea ice / emperor population equation is not always straightforward. Fast sea ice (that is, sea ice connected to land) is a vital feature of most breeding colonies, but if the ice is too extensive, and a female emperor takes too long to make her mid-winter commute between the crèche and open water feeding grounds, the starving male may abandon their egg to save himself. On the other hand, reduced sea ice extent has been linked to other problems, such as lower numbers of krill, leaving less food for penguins. Nevertheless, overall and over the longer term, sea ice decline is expected to reduce emperor penguins’ total global population by one fifth at the century’s end. Good estimates of the global emperor population are now available thanks to satellite imagery, indicating a population of almost 600,000 birds today. Although the new study finds that some colonies could increase for a while, any growth is expected to be short-lived, with numbers ultimately falling as Antarctic sea ice diminishes. Jenouvrier et al. (2014) Projected continent-wide declines of the emperor penguin under climate change. Nature Climate Change. 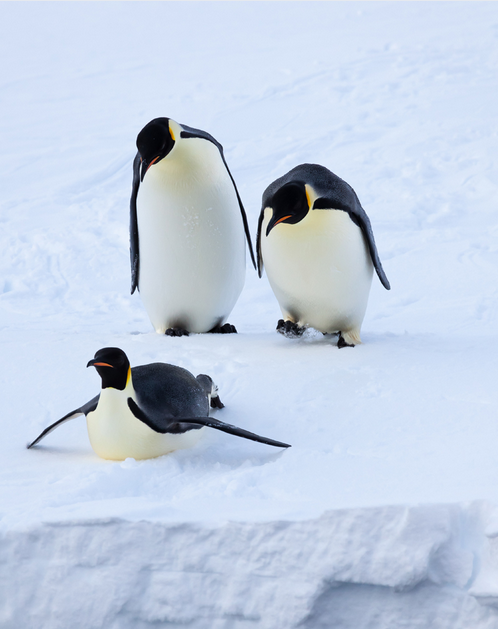 Woods Hole Oceanographic Institution (2014) Study finds emperor penguin in peril. University of Amsterdam (2014) Future of emperor penguins on thin ice.